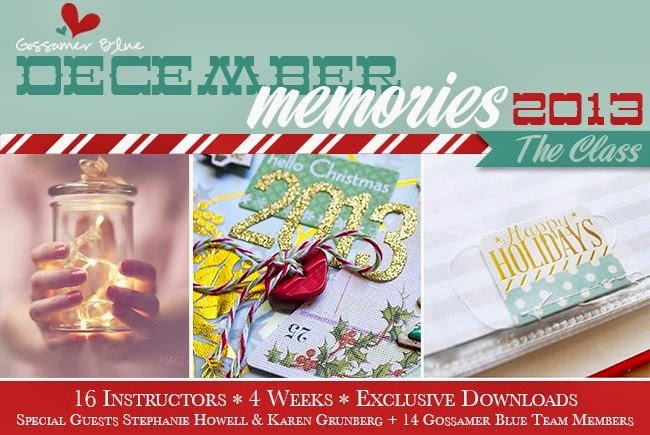 The December Memories Class runs for 4 weeks beginning on November 4th. The classroom will remain open until December 31st. Instructors Special guests Stephanie Howell and Karen Grunberg along with Gossamer Blue team members Cindy Liebel, Naomi Atkins, Jill Cornell, Jina Jean, Adrienne Alvis, Michelle Wooderson, Katie Ehmann, Stephanie Bryan, Magda Mizera, Jessica Lohof, Kasia Przybyt, Traci Reed, Heather Leopard and Anabelle O’Malley. Each week for four weeks there will be topics posted on Monday through Thursday. Friday will be a homework assignment that is optional and intended to help you stay on track. This interactive class is intended to help you create and complete your December Memories album, to be prepared with a plan of action and to be ready and excited to go by December 1st. You will be inspired to action by our amazing team of instructors, each bringing special and unique viewpoints to the class. Students and instructors can interact with each other through a private Flickr gallery and forum. The topics will cover a wide range from planning and photography to journaling and design. While the design part of this course is dedicated to a 6×8 divided page album format, anyone who wants inspiration around planning, photography, journaling and design will benefit from this course. You will also get to participate in a community of like-minded crafters working toward the same goal. Registration closes on November 4th. All content, including text, photographs and concept design elements are © Michelle Wooderson. Content within this blog is shared for personal/non-commercial use and inspiration only. Thanks!